After last year’s Vase heroics, Anchors fans can be excused for allowing their mind to briefly mull over the prospect of a return to English football’s grandest stage. There is a long way to go before that dream can become reality but with performances of this ilk, Michael Dunwell’s men will take some stopping. The Anchors have waited a long time to kick-start this year’s tilt at the Vase due to last year’s performance and it seemed like they didn’t want to wait a moment longer as they broke the deadline inside the first two minutes of the game in sensational fashion. Fred Woodhouse picked the ball up just outside the Ashington area and hit a left-footed strike that arrowed into the top corner of Conor Grant’s net, the Ashington goalkeeper powerless to stop such a stunning strike. Fred Woodhouse’s thunderbolt of a strike opened the scoring. Ashington responded well and the game’s opening few minutes progressed at a frantic pace. They could have levelled through Zak Atkinson but he was denied by a smart stop from the returning Liam Jordan, the Stockton stopper reacting quickly to deny the rebound also. The visitors would be made to pay for being wasteful in front of goal when Stockton doubled their lead in the eighth minute. Tom Coulthard’s clearance landed nicely for Chris Stockton to race onto on the counter attack. The winger carried the ball forwards before crossing to the back post. His looping ball found Mikey Roberts in space and the Anchors’ leading marksman squeezed the ball home from close range for his sixth goal in as many games. Mikey Roberts doubled the Stockton lead inside the first ten minutes. Ashington once more responded well and could have halved their deficit ten minutes later. Shaun Vipond’s inswinging corner from the left was dangerous and was met by David Edwards six yards out from goal. The Ashington captain didn’t connect as he’d have liked and sent his effort wide of the mark when he really should have found the net. Once more, Ashington were punished for their inability to take their chances by an increasingly potent Anchors attack. It was 3-0 on 25 minutes and inevitably it was Roberts again. The forward, who was voted as October’s Player Of The Month by Anchors fans, has been in sensational form and showed his desire in front of goal. Peter Bulmer beat substitute full back Jay Hornsby before crossing into the middle. 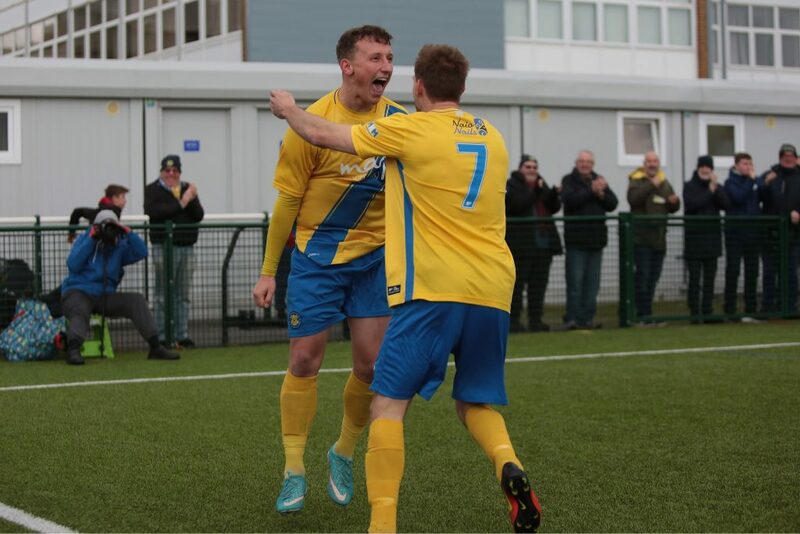 Roberts leaped bravely and beat the onrushing Grant to the ball to nod home his side’s third. Mikey Roberts continued the form which saw him named October Player Of The Month. Despite Stockton’s firm grasp on the game, Ashington were able to carve out a great chance on the half hour mark. Jack Butler’s through ball was perfectly weighted into the path of Gerard Richardson and the forward struck goalwards but was denied by Jordan, who raced off his line and closed the angle well to preserve his clean sheet heading into half time. Stockton should have been out of sight four minutes after the restart as a glorious opportunity fell the way of Nathan Mulligan. The Anchors countered at pace through substitute Sonni Coleman. He laid the ball off to Roberts down the right and the forward squared the ball across the area to Mulligan. The midfielder has enjoyed a prolific campaign in front of goal but he couldn’t find the net on this occasion. He leaned back as he struck goalwards and the ball arched over Grant’s crossbar. After the referee waved away Stockton appeals for a penalty for what looked to be a foul by Vipond on Woodhouse, Ashington enjoyed their best spell of the game. They cut their arrears on the hour mark as the Stockton defence seemed to switch off. 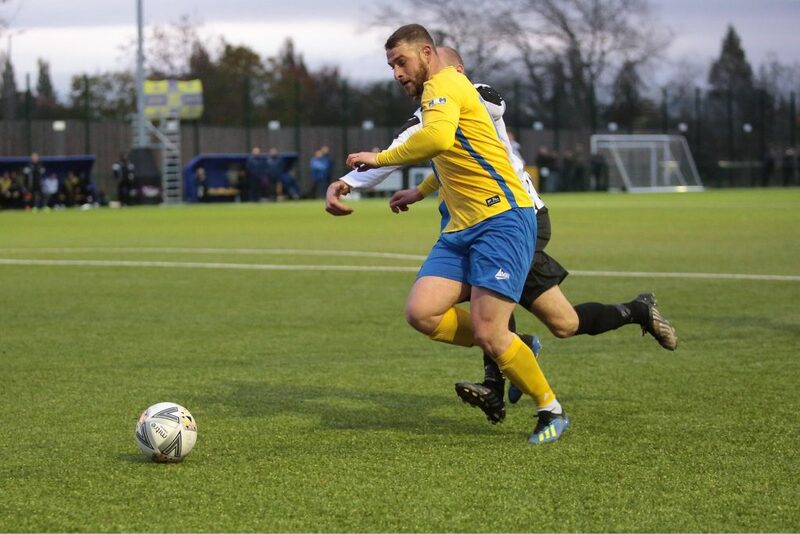 A routine corner from the right by Lee McAndrew found the head of Glenn Caygill, unmarked in the middle, and the defender thumped home a header beyond Jordan to get his side back in the game. They should have found the net again on two occasions in as many minutes just moments later as first Butler and then Atkinson hit the side netting on opposite sides of the goal when both should have done better and made Stockton nerves begin to twitch. James Risbrough and the Stockton defence managed the game well. The game was sealed 15 minutes from time by a goal fit to win any game. Mulligan, who scored five goals in the month of October, got his sixth in as many games was a remarkable strike from range. 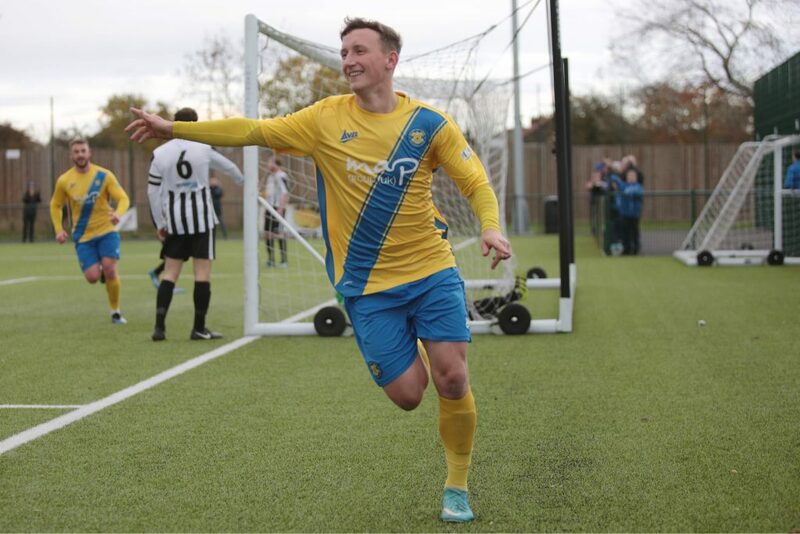 With Stockton fans still calling for a free kick after Vipond upended Bulmer, Mulligan unleashed a seemingly speculative effort at goal but one that sailed into the net from range as the Coverall Stadium rose to acknowledge another stunning FA Vase moment for the Anchors. 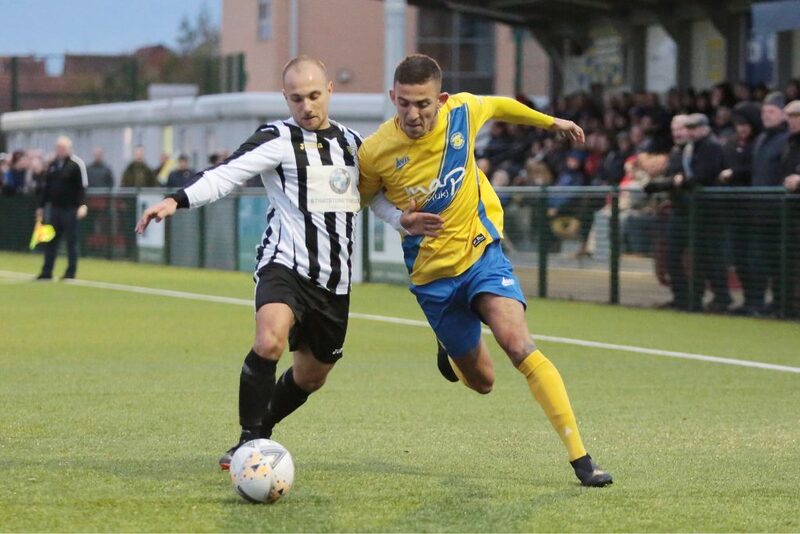 In the closing moments, Stockton pressed for a fifth but Grant did well to deny substitutes Coleman and Joe Carter to keep the score down for his side. The damage was done, though, and it was Stockton who progressed into the competition’s third round. Anchors fans have fallen in love with the FA Vase and will undoubtedly dare to dream of what might be once more. 64 remain, why not us? Full time at the Coverall Stadium: Stockton Town 4-1 Ashington. 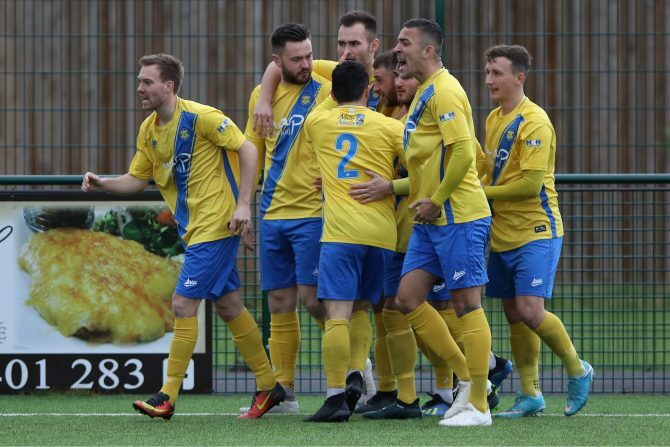 Stockton Town: Jordan; Garbutt, Coulthard, Nicholson (c), Risbrough; Craggs, N Mulligan, Woodhouse (Mohammed 79’); Stockton (Coleman 46’), Bulmer, Roberts (Carter 82’). Subs not used: Ward, D Mulligan. Goals: Woodhouse 2’; Roberts 8’, 25’; N Mulligan 74. Ashington: Grant; McAndrew, Caygill, Edwards (c), Armstrong (Hornsby 21’); Youldon, Henderson, Vipond, Butler; Atkinson, Richardson. Subs not used: Wade, Norris, Bowey, Glasper.